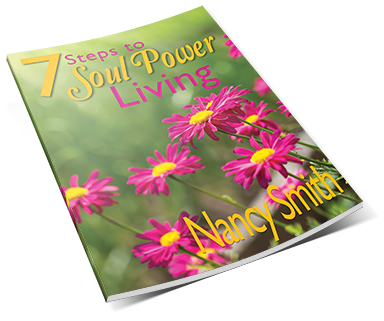 7 Steps to Soul Power Living is brought to you by award winning author of Divine Love Affair and Akashic Journey, Nancy Smith. An Akashic Master and Spiritual Medium, Nancy offers a 7 step pathway to Brighten Up Your Inner Sparkle! FREE REPORT: 7 Steps to Soul Power Living. These simple 7 steps will help you quiet your mind to hear the still peaceful presence of your Soul. Your Heart and Soul always know what to do. A pressure filled life and busy mind can be so loud you may lose focus on what your Heart and Soul are telling you. Take a moment to try these simple steps to bring you back to YOU! This guide will help you learn to take steps that remind you to enjoy yourself. 7 Steps will teach you how to make a habit of doing what makes you happy. This report will help you discover and learn how to create a safe sanctuary within your heart. Learn techniques to surrender your struggle and plug into the power of your Soul. In this guide we will help you observe where your life is REALLY taking you. You will learn how to redirect yourself to the best possible direction for the best possible outcome.